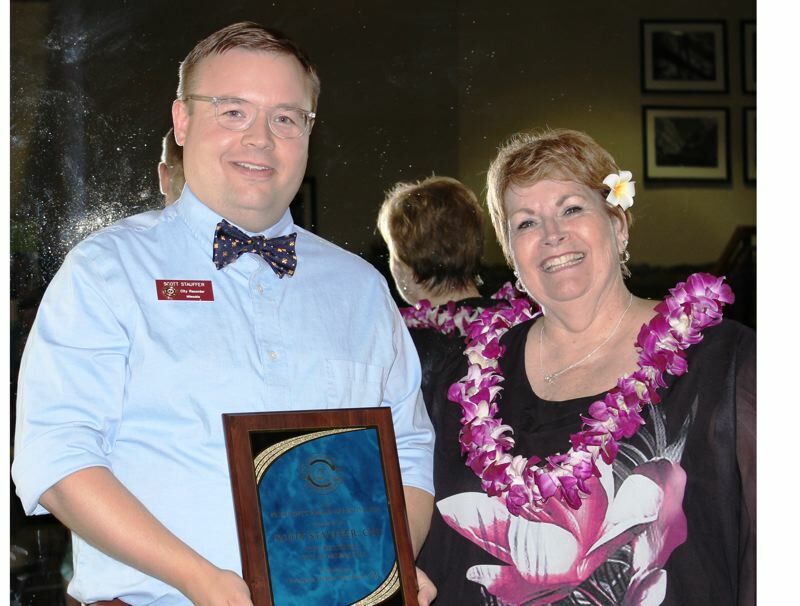 Oregon Association of Municipal Recorders President Debbie Hamilton presented Milwaukie City Recorder Scott Stauffer with what she called a "well deserved" award for contributing greatly to a committee and performing exceptional work for OAMR. Stauffer said he was humbled and shocked to receive this year's Award of Distinction at the association's annual conference banquet held Sept. 21 at the Holiday Inn at the airport in Portland. "I had nominated a colleague for another award, and I thought the introduction material sounded familiar — but, as it turns out, what President Hamilton was reading was about me," Stauffer said. "To be called out before my peers is an honor. I truly feel called to do the work I get to do every day at City Hall." An active member of the statewide organization since 2014, Stauffer chairs OAMR's Records Management Committee. He has served on the OAMR Conference Committee, Legislative Committee and the ad-hoc Attorney General's Public Records Reform Task Force. During the last couple sessions of the Oregon Legislature, Stauffer and other active OAMR members supported legislation that has created the Public Records Advocacy Council and the hiring of a state-funded public-records advocate whose job it is to help citizens access public records. With a goal of developing policy for increased govenmental transparency, the council's 14 members include three journalists, State Rep. Karin Power (D-Milwaukie) and a city recorder. "Generally we supported the new timeframes for responding to public-records requests," Stauffer said. "We particularly were pleased to see that the law acknowledged that many public agencies (cities especially) are small organizations and may not be able to meet the new deadlines; we agree that agencies must respond to requestors and provide information as quickly as possible — while also balancing the agency's need to be efficient, protect exempted/sensitive information and use public resources appropriately." Stauffer received his Certified Municipal Clerk designation in 2017 and is actively pursuing the prestigious Master Municipal Clerk designation from the International Institute of Municipal Clerks. He said he was fortunate to have replaced a "legend in the municipal clerk world," former City Recorder Pat DuVal, in 2016. "Pat left the office in very good shape and I aspire to build on her three decades of work," Stauffer said. "I am also fortunate in that I am serving a remarkable city at a historic moment for the community. There's a lot going on and it is a privilege to work for this City Council, city manager and with all my colleagues at the city. I am honored to serve and I am grateful for the recognition."